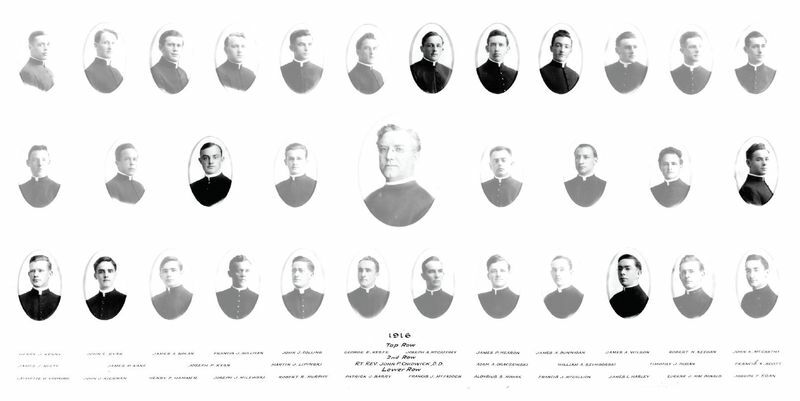 St. Joseph’s Seminary’s class of 1916 was ordained on June 17, 1916. Less than one year later, the United States would enter the Great War. Of the 32 men who were ordained together, eight would go on to serve in the military as chaplains in some capacity. Rev. James Dunnigan was commissioned as a First Lieutenant Chaplain on August 5, 1918 and served at Mitchell Aviation Field on Long Island; Camp Penniman, Virginia; and aboard the troop transport ship Mercury. He was discharged in October 1919. Rev. James Harley was commissioned August 10, 1918 and served at Camp Jackson, South Carolina until he was discharged in December 1918. He later went on to serve as the Director of the Society for the Propagation of the Faith. Rev. James Hearon was commissioned on April 1, 1918. He served with the 104th Calvary and the 43rd Field Artillery in Leon Springs, Texas. After his discharge in January 1919, he was commissioned a First Lieutenant Chaplain in the Officers’ Reserve Corps. Rev. John Kiernan was commissioned on October 22, 1918, and sent to Fort Oglethorpe, Georgia, and later served on Transport Duty. Rev. Joseph McCaffrey was commissioned a chaplain on April 6, 1918, exactly one year after America entered the war. He was sent with the 9th U.S. Infantry, 2nd Division, to join the American Expeditionary Force in France. He was in action in various places throughout France, including Soissons, Aisne-Marne, St. Mihiel, Pont-a-Musson, Champagne, and Argonne. He received an American citation for gallantry as well as the Croix de Guerre, both in October 1918. He was discharged in August 1919, and served as parochial vicar at St. Rose of Lima, Manhattan, as well as First Lieutenant Chaplain for the Officers’ Reserve Corps. Rev. Joseph Ryan was commissioned a chaplain on August 5, 1918, and was sent to serve at Camp Greene, North Carolina until his discharge in March of 1919. Rev. Francis Scott was commissioned a chaplain on September 26, 1918. He was initially sent to Camp Taylor, Kentucky, and then served overseas with the American Expeditionary Force in Gievres, France. After his decommissioning, he served as a parochial vicar at St. John the Evangelist in White Plains. Rev. Lafyatte Yarwood was commissioned a chaplain on August 18, 1918. He served as chaplain at Camp Upton, New York, until his discharge in December. He continued to serve as a chaplain for the New York National Guard until 1920. Msgr. 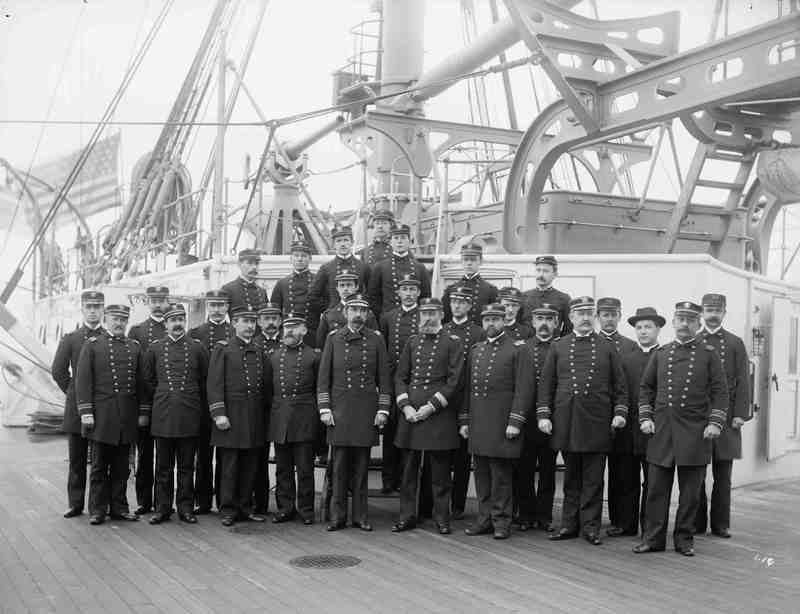 John P. Chidwick (third from right) with other officers on board the U.S.S. Maine. Courtesy the Library of Congress.